You are here: Home / Blog / Leadership / Where’s the Slack in your Worship Team? WHERE THERE’S SLACK… THERE’S LACK! If there is slack in your audition system, you will have a lack of volunteers on your team. 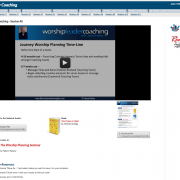 If there is slack in your worship planning system, you will have a lack of creativity and excellence in your services. If there is slack in your personal growth, you will lack the spiritual foundation, skills and ideas necessary to lead a healthy and growing worship ministry. This principle is so simple, but so important to your worship ministry in 2016. Because here’s the truth: Where’s there’s slack in your life, you will find it in the life of your worship ministry. If you are slack in your preparation for rehearsal, don’t be surprised when your team shows up to rehearsal unprepared. But here’s the GOOD news. Where there’s excellence in your life, you will find that in the life of your team. So – this year decide to sow generously into your personal growth… your leadership… your ministry systems… and watch as God blesses those areas of your life. PS – Take a moment to think about that question… Where is the slack in my worship ministry?Most of the time, slack in your worship ministry is not a heart issue, it’s a systems issue. Your worship ministry systems are giving you exactly what they are currently designed to give you. So if you’re not happy with the growth and health of certain areas of your worship ministry, then you have to change your systems! That’s why I want to invite you to join my NEW 12-month systems-based Worship Leader Coaching Network! 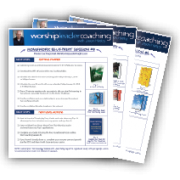 To learn more and join today, go to: www.WorshipLeaderInsights.com/Coaching. Three Goals Every Worship Leader Should Have in 2016 How is your Worship Team “Really” Doing?